This year’s Akademy, the annual world summit of KDE, was held in the beautiful city of Vienna, Austria, from 11th to 17th August, 2018. The 7-day event was divided in two parts, with the first 2 days being mostly keynote addresses and different talks by KDE contributors, followed by 5 more days BoFs, and workshops. Just like every other KDE event, this one was also as awesome as it could get. The evening before the day the conference was scheduled to start, there was a nice welcome party with loads of food and drinks, where I got to catch up with most of the fellow KDE contributors who I hadn’t met for quite some time, and also got to see a lot of new faces as well, talking to whom felt like a breath of fresh air. Overall, it was a warm welcome, and raised everyone’s spirits to get ready for Akademy for the next day. Day 1 was opened by Lydia, our beloved President of KDE. Dan Bielefeld gave the keynote speech, where it was interesting to learn about how free software helps in tackling human rights issues in North Korea. Numerous insightful talks followed it throughout the day. Bhushan’s update on Plasma on mobile devices was interesting, along with David Faure’s talk on how to run KDE softwares without installing them. Day 2 began with the keynote by Claudia Garad where she spoke on how KDE could learn from how Wikimedia faces its hurdles. Aditya Mehra spoke on the visionary Mycroft AI on Plasma. Bhavisha spoke about her contributions to OpenQA. Andreas’ talk on building Automotive ECUs with Yocto was absolutely inspiring. In the Akademy awards, it was great to see deserving individuals being recognised for their amazing contributions. At the end of day 2 of conference, we headed off and met at the nearby Cafe Derwisch – Partycellar to party. Even though there was a looong wait in a queue, it was worth the wait. With loads of food and drinks, and a dance floor, it was the perfect recipe for having fun and socialising. And boy did we make legit use of the dance floor. The party was quite eventful and went way late into the night. It was an evening to remember. In the KDE-India BoF, we discussed the journey of India in KDE so far, the obstacles we faced previously, the best steps we can take for the next conf.kde.in event, among other topics. The Mycroft BoF taught us how to use the AI, how to add new skills, its progress with Plasma mobile, and the obstacles it faces regarding communicating with 3rd party apps. The BoF on the VVAVE Project was particularly interesting to me as it was centred around a music-player app that is similar to the line of software I work on in my current company. We discussed a number of issues, including how to prioritise between online-streaming and playing local files, and how to overcome the technical challenges. The training on documentation provided tips and tricks on writing short, informative and comprehensible documents, followed by a hands-on assignment. This was very helpful. Also, this year is the first time I was able to be a part of the Annual General Meeting, and it was an interesting experience especially for being able to influence the decisions made inside KDE in such a direct and important way. There was a short walking trip organized on Tuesday evening, August 14, where we walked around interesting parts of the city, with magnificent monuments, churches, libraries, museums, palaces, and sculptures flooded all around. The guide was kind enough to explain the historical significance of each building. Clearly a treat for the eyes and knowledgeable as well. The following day, August 15, we went to Kahlenberg, where we enjoyed the amazing view of the beautiful city of Vienna from above. We also went to the top of one of the towers to take a look at it from even higher. On the final evening of the conference, August 17, we went to have a short picnic somewhere overlooking the Danube river. That was fun as well. Or rather sad, as that was the final day of the conference. My phone is filled with amazing pictures, thanks to all these fun initiatives. Thank you, KDE, for letting me be a part of this amazing event. Keep rocking! Made the bookmarks dialog responsive to touch everywhere. When we tapped on the Search field in the app, if nothing was written in that field then the bookmarks dialog showed up there. If the number of bookmarks was <= 6, then the far-lower part of the dialog did nothing on being tapped. Made that portion choose the last item from the bookmarks list in that case. There was an issue where pressing the back-button always led to closing the app instead of handling that event depending on the various scenarios. On looking, it was found that the root-cause for the issue was lying in the code of Kirigami itself. Reported the same to Marco Martin, and fixed the issue in the Marble app via a workaround by using Kirigami.AbstractApplicationWindow instead of Kirigami.ApplicationWindow in the Qml. Also reported the issue that svg icons were not showing up in the app on Plasma Mobile because of svg icons not being enabled there. Worked on adding a splash screen to the Marble Maps app. The highest resolution of the Marble logo in png that we had at the moment was 192 x 192, which looked a bit blurry, as if it had been scaled up, so I just displayed it as 100×100 for the splash screen to make it look sharp. Later, Torsten created a 256×256 version of the png from an svg, which got rid of the blur in the previous png. So I added that in the splash screen later, and the icon there looks much bigger, sharper, and non-blurry now. Apart from work, there was snow this year, did some interesting acro-yoga with Frederik, did a 3-hour hike to walk across the longest pedestrian suspension bridge in the world, went on a tour to Zermatt to catch a glimpse of the Matterhorn, and ended it all with having a delicious barbecue with Emmanuel and Tomaz somewhere up in the mountains on the final evening. Thanks to Mario for organizing the meetings and the cheese and chocolates, without which no work could have been done. First of all, cmake was picking up the wrong target for aprs plugin, so I made cmake to skip the aprs plugin for Android, so that it does not lead to an unnecessary crash during building it. There was a bug in the Route Simulation position provider plugin, it was not working in the Navigation mode. Made a fix to that. Replaced the older QImage based current-position pointer, with a QML based one in the Android app. So now we are able to make our custom animations on it. The current-position pointer will be staying at points on the route itself, when the user is very close to the route (not too deviated from it). With the new QML based pointer, we made sure that the radius of accuracy remains the same with respect to the Earth irrespective of which height we are viewing the map from. Plus, we have got rid of this accuracy-indicator when the position-pointer is already on the route, and are showing it only otherwise. There was a minor bug with this in the desktop version as well. Imagine that while you’re simulating a navigation through a route between New York and Boston, you zoom out till the whole Earth is visible, then rotate the Earth so that the other half of the globe, for example India, is visible now, instead of America. In that case the position marker was showing up on the top-left corner of map (somewhere in the sky), when it was supposed to not be visible at all since it is theoretically present on the other “not-visible” side of the globe now. So this bug was fixed as well. Used some new maneuver direction pixmaps for navigation in the Android app, getting rid of old ones, and also made them look sharper in the Navigation info-bar while they were shown during turn-by-turn navigation, by making some tweaks in the QMLs that were using them. Finally, the distance text that shows on the top while in Navigation mode, its border height has been changed to match the height of that of the maneuver pixmaps shown on its left as well, so that the view looks much more uniform. Plus, a similar panel has been added at the bottom as well, that shows the speed and distance information during the navigation, each at two different sides of the panel. That’s all about work. And adding to the yummy food that turns out to be truly delicious every single year, this time we had some more fun activities as well. We were fortunate enough to board a cable-car to ride to as high as possible in the mountains, so much that we ended up finding ourselves in snowfall ( it’s my first time being in a snowfall 🙂 ), which was amazing! The special red tea we were greeted at a stop at a restaurant during the hike was pretty unique. We then visited a museum, and that was a lot of fun as well. One more Randa Meetings just got over, and even though it has been about a week since then, I still keep thinking about the awesome moments I spent when I was there. Got to meet Dennis and Torsten after a long one year since the last year meetings. And this time it was even better because this time they stayed there for the whole week, which was not the case last time. To add to the excitement, this time Torsten had brought his telescope as well, along with a couple of his binoculars. It was around midnight on the very first day of the meetings, when a bunch of us had gone out to take a look at the clear starry skies through his telescope. Although our hands and legs literally froze there after an hour or so from the cold outside, I finally got to know why most of the stars are visible only in a certain part of the sky, got to see a bunch of constellations, and also the Andromeda galaxy as well. It was awesome, thanks to Torsten and his telescope. Started hacking on Marble right on from the following day. This year, we worked mainly on the Marble Maps and on OSM vector tile rendering for particular altitude levels in the map, by working on the Marble library, which means that it can be visible on both the desktop and the mobile versions. We have come a long way in making progress on Marble Maps, and hope to release it to the public soon for a few months. So, watch out. from where we did an almost 4-ish hours of walk back to Randa (my right leg still hurts from the walk :P) which was too much fun and would love to do that again the next time. And the food, oh it just couldn’t get better than this. I still miss the lasagna. 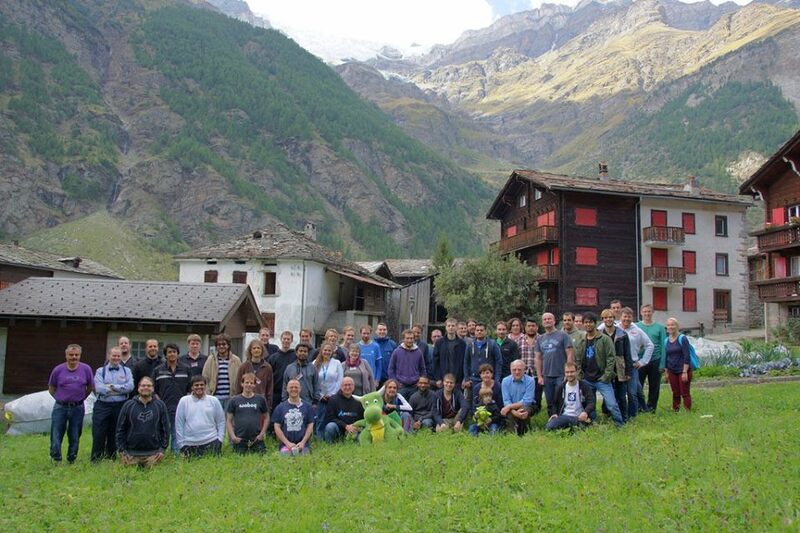 It is time for one more Randa Meetings this year, and over 50 KDE developers are going to participate in it along with me as well. The Randa Meetings is a codesprint sponsored by KDE and organized by Mario Fux, in which KDE developers from all across the globe are invited, and get to sit under the same roof and work together to collaborate on different ideas, coming up with some awesome feature implementations within a time span of about a week. These meetings generally focus on a common topic every year. Last year (2014) it was focused mainly on porting of various KDE applications to the KF5 framework. Similarly, this year we have a common focus as well, and it is aimed at bringing more of KDE to the mobile platform as much as possible. Now, since I am a Marble developer, let me tell you in brief what are my plans for Randa Meetings this year. Marble is a virtual globe software, released for use in Desktops for now, but we’re working on “Marble Maps” for Android currently, which brings the openstreetmap + navigation/routing parts of Marble to Android. Although this Android app is still in its beta version for now and is going through a lot of testing at the moment, it will be openly available in the Play Store for being installed by everyone very soon. Along with that, we also plan to release an app called “Marble Globe” for Android later, which will focus more on different map themes, different planets, satellites and so on. For Marble Globe we think that it would be very interesting to include the “interactive tours” feature there prominently. So there could be a tour that shows landing sites on the moon. And another one that introduces certain interesting spots of a historical map. And so on. We would need declarative/qml support for tours to do that, and probably some other extensions as well that plain KML tours do not support out of the box. So we are interested in exploring these stuff, and are going to discuss these topics in Randa. Apart from that I am going to polish the existing feature in the desktop version as well. Akademy 2015: An awesome experience. 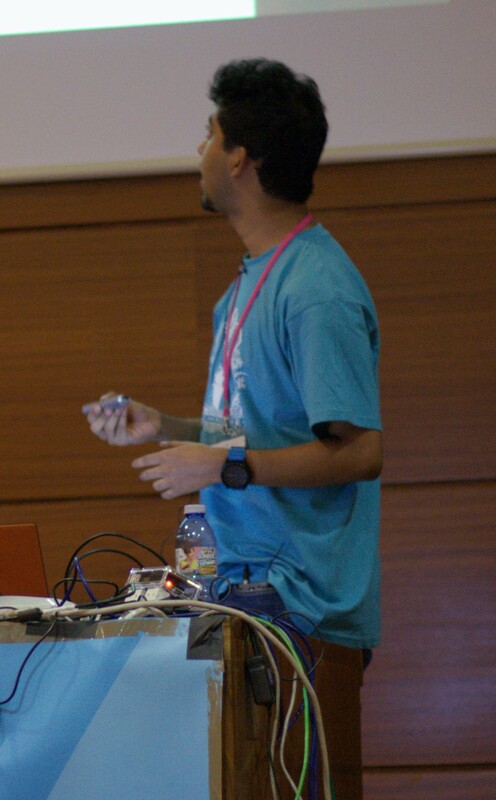 So this was my very first Akademy, and I was excited about attending it ever since the beginning of when I started contributing to KDE a couple of years back. Feels great to have finally made it. Although I had some visa problems at the New Delhi airport because of which I reached A Coruna quite late and missed out on the entire first day of the conference, still I’m glad I could at least reach Rialta by sunset of that day and be able to attend the rest of all the days at Akademy. So Day 2 began with the keynote speech by Lydia Pintscher on “Evolving KDE”, where many concerns regarding how KDE began, where it is going, how it needs to change, were discussed among many other things as well. It was really interesting, very motivating and I loved it, the best way the day could have started. Following this, were an array of many other talks as well, one of which I loved a lot, was the one given by Andrew Lake, where he spoke about visions, and how important it is for any product’s growth. His examples about a few “this is how *not* to write a vision” visions were hilarious. Overall, it was very interesting and fun to attend, and very informative of course. 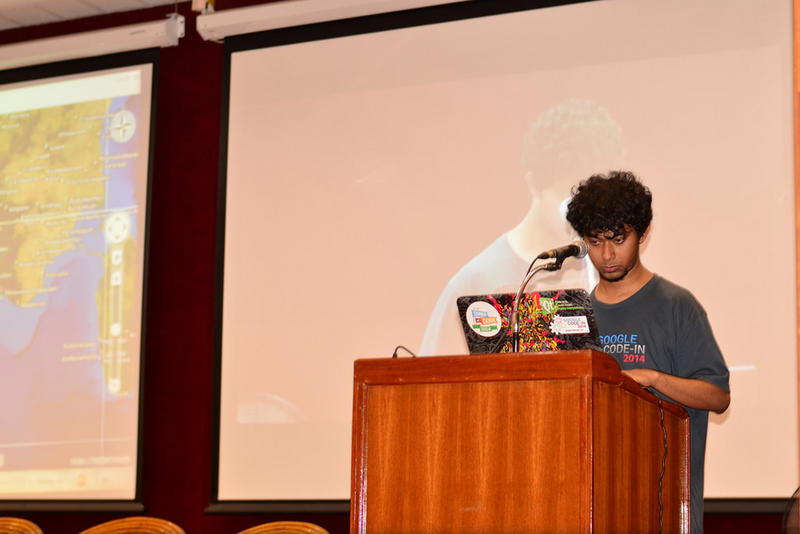 And then Vishesh Handa also spoke about file searching in Baloo in his talk, and how file searching and indexing happens in various other softwares and platforms, compared to how KDE does it in its browser in a more efficient way, was too good. Following the first half of talks, there was the group photo (glad I didn’t miss this 😀 ). On the second half of the day I gave a very brief lightning talk about my previous year’s GSoC project on implementing interactive tours in Marble. It kind of finished very soon, and I still regret why I did not extend it with a few demos by creating some tours on-spot or something of that sort. Still, hope people didn’t find it too boring. What felt very good though, was when Valentin Rusu came to me some time later that day to let me know about a website called flightradar24, which shows real time flights that are actually taking place right now all across the globe. Although these are real-time flights and are not similar to those that happen in Marble tours (tours in Marble are only virtual and don’t deal with actual real-time flights in airplanes), the link he sent me is pretty awesome and you should check it out once here: http://www.flightradar24.com/. 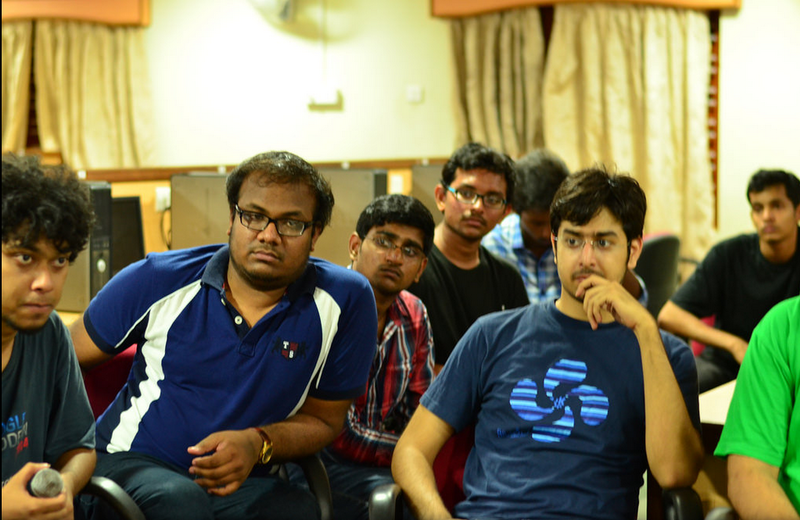 Apart from all this, there was a questionaire session with the KDE e.V. where various topics were raised, many interesting questions asked and answered, many secrets revealed, including the “secret handshake” ( 😛 ). It was totally awesome. Finally the day ended with the Akademy awards, where two of my most favorite KDE applications, that is, KDevelop and KDE Connect, were awarded, which they totally deserved, so I was very happy about it. The organizers were given a big thanks as well, along with all the sponsors, where Frederik Gladhorn from Qt, said something interesting, that is, “Be a good coder. But you need to be a good person before that” which was awesome to listen to! So, after the first two days of talks, up next were the BOFs starting from day 3. The BOFs were too good. Lydia’s BOF on “Evolving KDE” was very interesting to attend, and many key points regarding what KDE actually is, how it should be correctly defined given the various types of projects under so many different fields that it supports, were discussed for a couple of hours, and it gave us a well detailed insight about the direction in which KDE is going as a whole, and ended with a decision to come up with a well-designed vision for KDE, among other things, in the next few days. It was good listening to everything that was discussed in this BOF. Next day there was a party at the terrace of Espacio Coruna, which was awesome. I took this opportunity to meet up with a lot of people I didn’t interact with in person before. I really really wanted to meet Lydia Pintscher for a long time. And I did. It was so great to talk and discuss stuff with her in person, exchanging various ideas, opinions, and whatnot. I caught up with Aleix Pol as well, and the conversations were enlightening indeed. David Edmundson is a fun guy to hang out with. So is Andreas, Vishesh, Pinak, Devaja and everyone else. Akademy is totally awesome, mainly because of this, and its such a smart way of helping you have such fun conversations with so many people in person, with whom you had only conversed online before that. The food was great, along with the beer and wine, and there were even freestyle dance steps performed towards the end as well. A totally awesome evening it was. On one of the next days, there was a tour to the aquarium as well. Viewing the shark from so close up-front was an out-of-this-world experience. Following that was a very long and tiring climb towards the top of the tower of Hercules, the view from which was magnificent. It was beautiful to be able to view almost the whole of the city from the top by standing on that tower. Last year I really wanted to attend conf.kde.in but couldn’t because my train tickets were not confirmed by the time it started. So, I had made up my mind right then, that I will definitely attend it the next year by all means. So, this year I applied and was accepted as a speaker too. But tragedy struck again, when some college issues clashed with the date of my flight, so I had to reschedule it once, and then one more time due to one more clash, after which I could finally reach Amritapuri in the evening of Day 1 of conference when it was already over. So, yes I was sad as I had missed the first day, but that also meant that I should make the best of the second day for sure. The second day of conference started with some great south-Indian breakfast, where I met up with some of the important people like Shantanu, Sinny, Pradeepto and others. 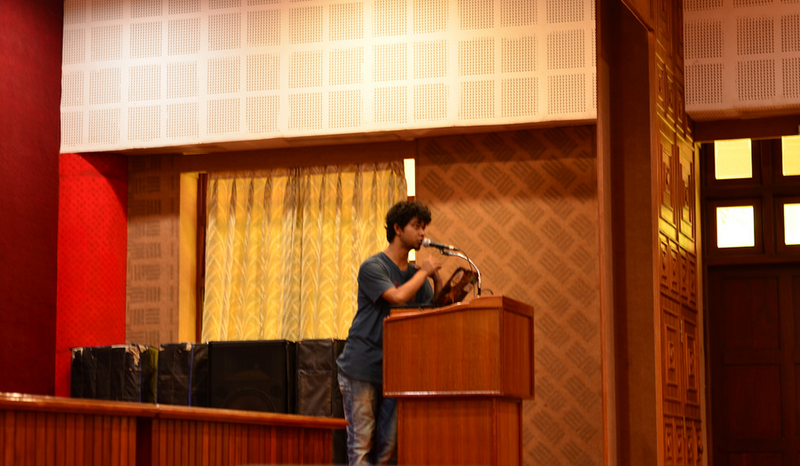 The first talk for that day was supposed to start from around 10:00 am, and I was the one to speak in it. I spoke on the ‘Interactive Tours’ feature that I had implemented in Marble last year, and it was pretty well received (I hope). My talk was followed by the rest of the other talks of the day, which were all pretty awesome, and very interesting as well. I got to meet Devaja, Rishab, Pinak, and the rest of the speakers during the talks, and I loved to interact with each one of them. 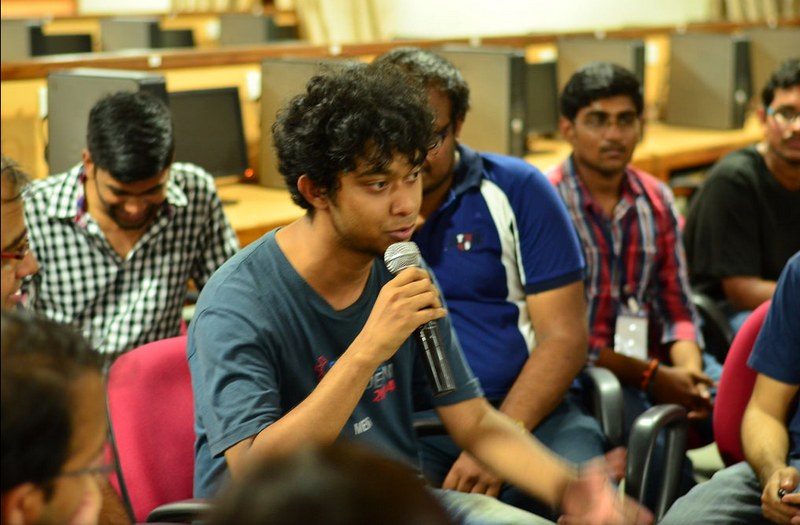 After a couple of talks after mine, I was asked by Sinny Kumari whether I would like to volunteer in a qml workshop which was being held in one of the labs. I didn’t wanna miss this opportunity, so I said “yes”, and went to the lab with her. The workshop started in a few moments, after everyone settled down. It was Shantanu who was explaining most of the stuff, using his computer screen as a projection, with me, Sinny, Pradeepto and Pinak helping the attendees in their computers in case they needed help or had some query. 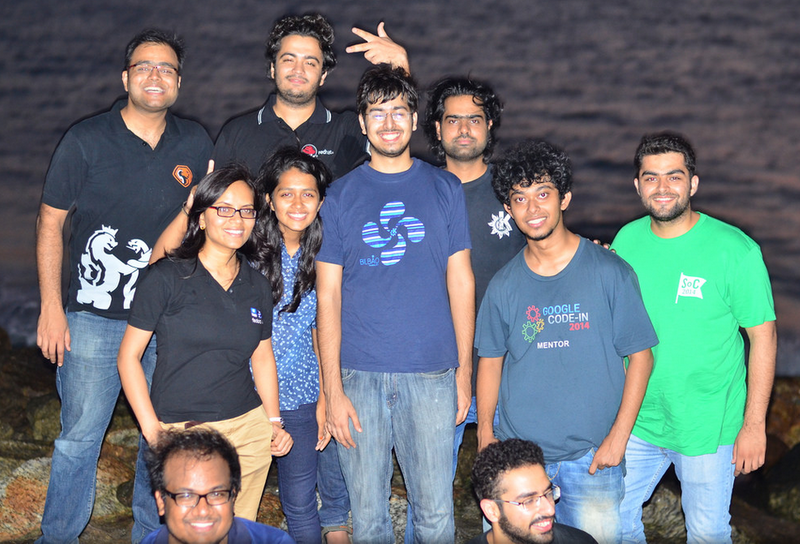 It was a very productive session, amazingly led by Shantanu, and I loved every moment that was spent in it. Well, the day ended with an awesome lunch, and a few more talks for the day. 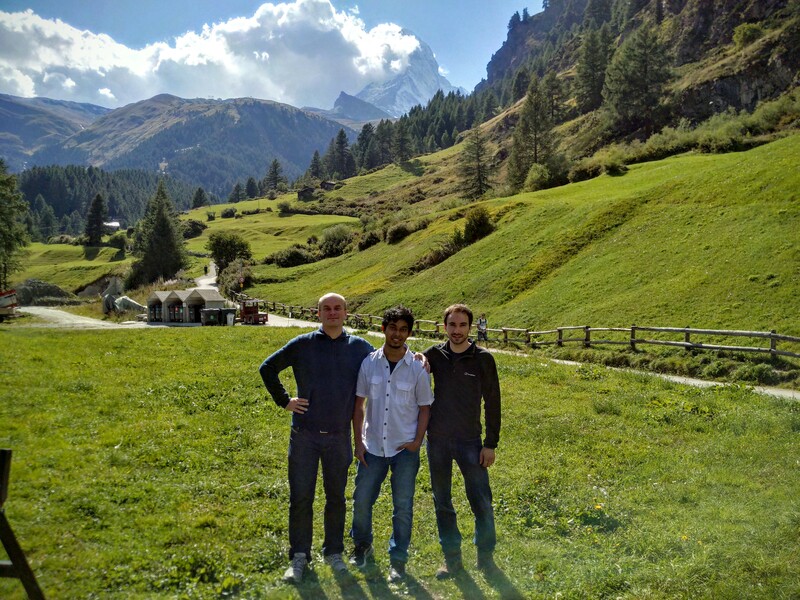 We were often approached by students from their college, asking us about our experiences with KDE, and how to start contributing. I answered them with my personal experience with Marble, and it went really well, with some good feedback from both parties. People were very enthusiastic and I loved spending time and exchanging information with them. After the end of all the talks, we went out for some sightseeing, rode a boat 😛 , saw some awesome views from a high building rooftop, went to the beach, had lots and lots of fun. and then finally came back, where we were invited to a lab, where each of the speakers and the students were saying their last viewpoints about the conference, what they liked about it, what could be improved. We told them about our awesome experience and that we would love to come back here again. 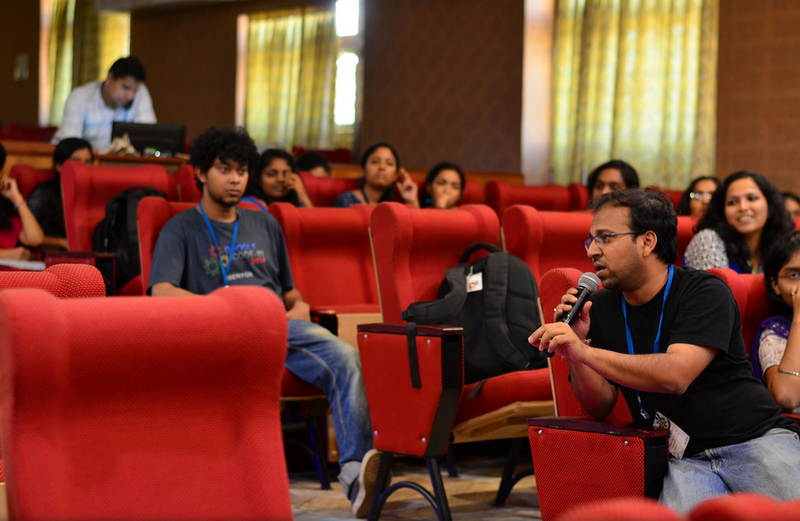 Speakers who were still in college were asked how they keep open-source contributions alive in their respective institutions, I told them about our the GNU/Linux users’ group of my college and the events that are organized by it. Pradeepto told us some really interesting and funny stories about KDE, which were really both fun and motivational to listen to.